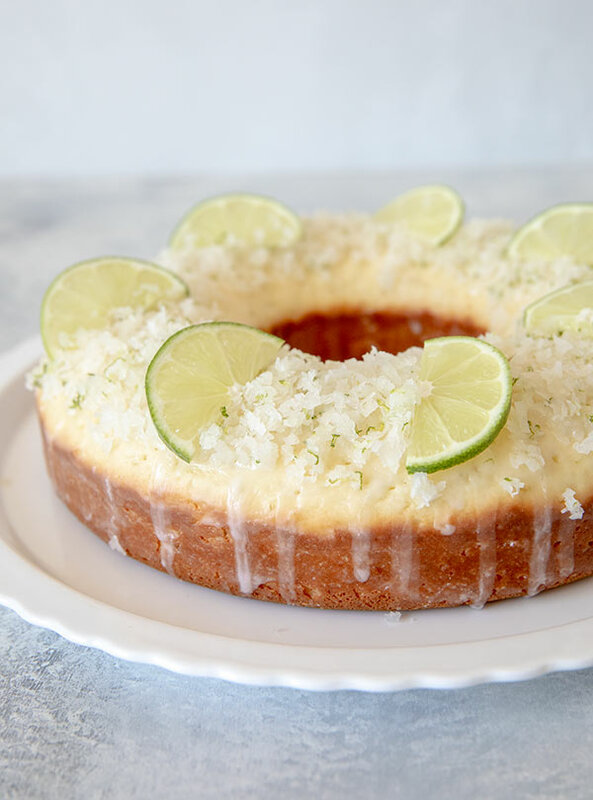 A lightly sweet, tender coconut lime cake with a sweet, tart glaze dressed up with a sprinkle of coconut and lime slices on top. This is an easy cake to make and everyone loves it. My family absolutely loves this cake. It has just the right amount of tartness and sweetness. The lime glaze you pour on it after it’s baked adds tons of flavor and a yummy coating like a glazed donut only tart. The cake is moist and dense like a coffee cake. Originally, I made this cake for myself for Mother’s Day. I’d been wanting to make the cake since Maria posted the recipe on her site, Two Peas and Their Pod. My friend Megan at Megan’s Cookin did a gorgeous version of it for Easter. Then a couple of days later, my good blogging friend Shelby posted a recipe for Lime Coconut White Chocolate Muffins and I knew I had to make the cake. Since I rarely have buttermilk on hand, I substituted light sour cream in the recipe. Another change I made to the original recipe, was to double the glaze. You poke holes in the warm cake and drizzle the glaze on the cake. Just add it slowly and let it soak into the cake. Then to help the coconut stay on top, you drizzle even more glaze over the coconut on top of the cake. Some great cake baking tips. First, to quickly bring your butter to room temperature you can cut it into slices and it will warm up quickly while you’re gathering your ingredients. Second, use a disher (scoop) to portion out the cake batter in a pan. This batter is thick and can be hard to spread evenly in the pan. 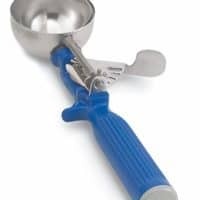 Using a scoop makes it easy. Third, when glazing your cake, put it on a wire rack inside a rimmed cookie shoot to catch any drips and make clean up a breeze. I’ve made this cake numerous times since I originally baked it. I’ve made it for friends and family, baked it as a 9-inch single layer cake, as well as the coffee cake version shown above. 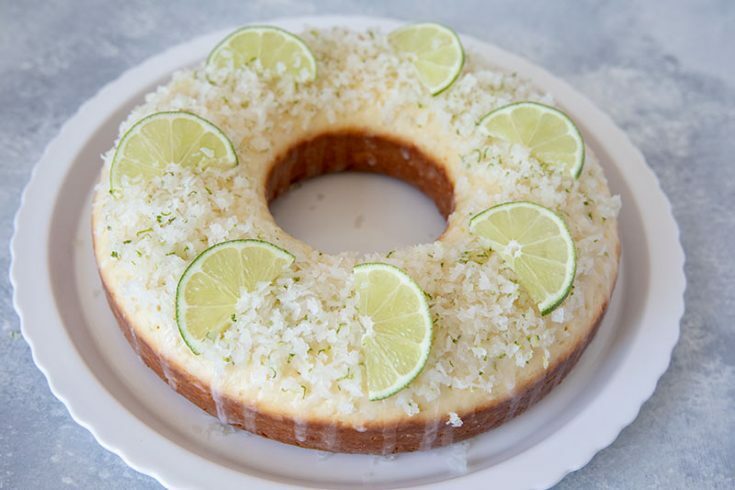 Decorating with the lime wedges isn’t necessary, but a fun way to show that it’s a lime and coconut cake. I recently baked it for a family get together and everyone wanted a second slice but there wasn’t enough for everyone to have two pieces. Next time I bake it, I’ll have to bake two cakes, so everyone can have a second slice. 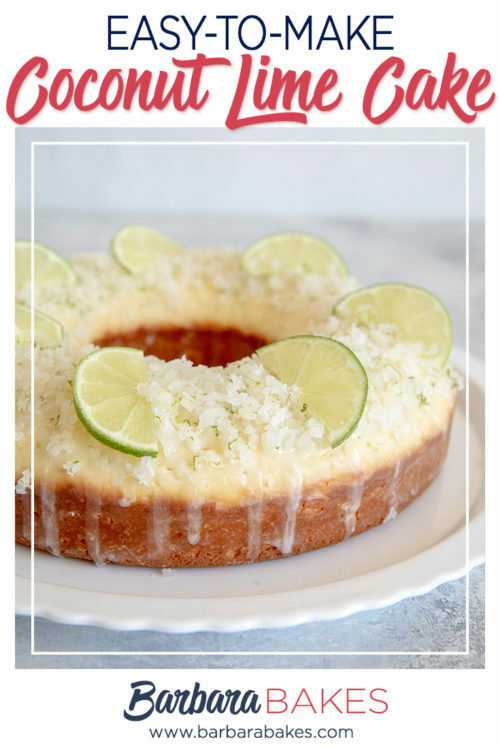 Definitely give this Coconut Lime Cake a try. You and your family will be glad you did. Preheat oven to 350 degrees with rack in the middle. 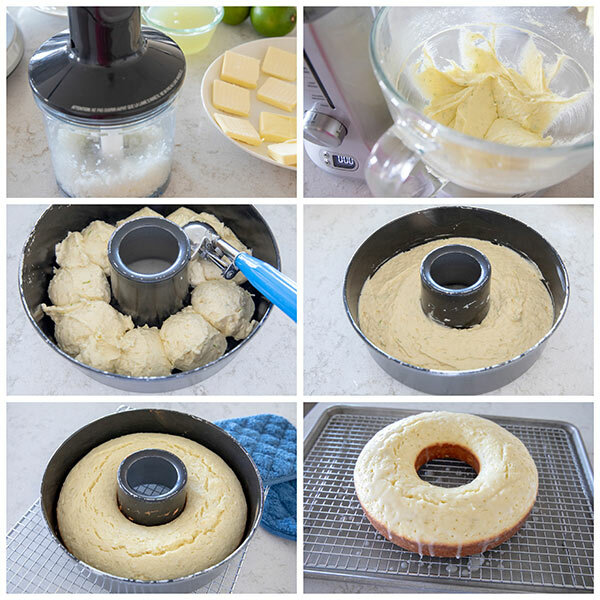 Butter a 9-inch round cake pan, line bottom with a round of parchment paper then butter the parchment paper, or spray a 13 cup coffee cake pan with non-stick spray with flour. In a small mixing bowl, combine sour cream and 2 tablespoons of lime juice; set aside. 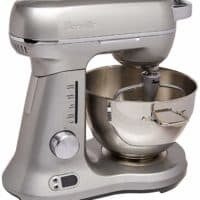 In a medium mixing bowl, whisk together the flour, baking powder, baking soda, and salt. 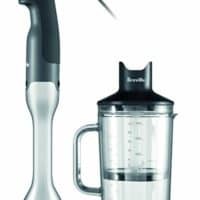 Place 1/2 cup shredded coconut and process in a mini food processor until finely chopped (you can also finely chop it with a knife). Stir the chopped coconut into the flour mixture and set aside. In a large mixing bowl, beat together butter, sugar, and lime zest with an electric mixer until very fluffy. Beat in eggs, one at a time. Turn mixer to low speed, add one third of the flour mixture, beat well, then beat in half of the sour cream. Beat in another third of flour mixture, then second half of sour cream. End with the last third of the flour mixture, beat until well combined, making sure to scrape down the bowl with a spatula. Spoon batter into the buttered cake pan and smooth the top with a spatula. Bake in the center of a preheated 350 degree oven until golden and a wooden skewer inserted in the center comes out clean, 35-45 minutes for a 9-inch pan, 20 - 30 minutes for a 13 cup coffee cake pan (an internal temperature of 210 degrees). Cool for 10 minutes on a wire rack, then turn out of pan and discard parchment if using. Whisk together powdered sugar and the remaining four tablespoons of lime juice. Poke top of cake all over with a toothpick or fork then pour glaze over the top and drizzle down the sides of the cake, reserving 1/2 cup. Pulse the remaining 1/2 cup coconut and the reserved lime zest in the food processor to coarsely chop it. 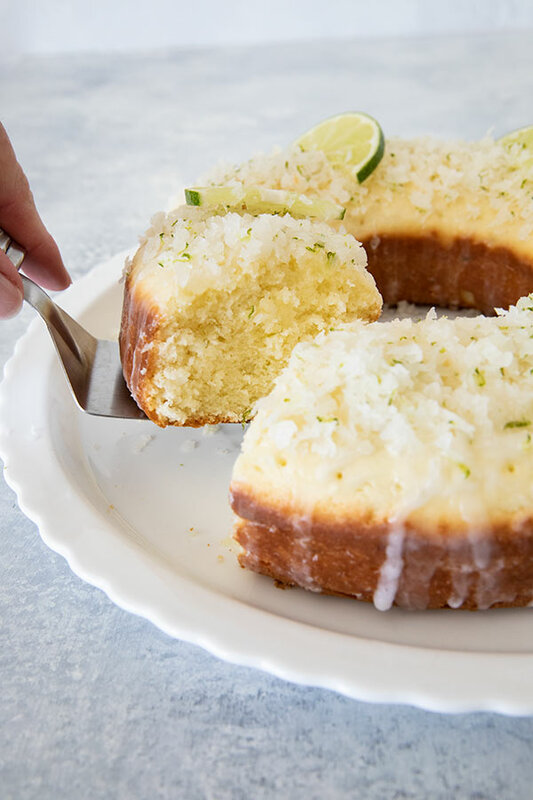 Sprinkle coconut on top of cake and drizzle remaining glaze over coconut. *High altitude changes: 258 grams cake flour, 212 grams sugar. Blend sour cream with 3 tablespoons of lime juice. Increase oven temperature to 375 degrees. Optional, stir in 1 cup white chocolate chips before spreading in the pan. This cake is wonderful. I took it to a family dinner and very little returned home. I would definely make it again.